The purpose of my PhD-studies is to investigate changes in the crystal lattice of minerals that have been subjected to shock metamorphism. Specifically, I work with so called shocked quartz, with is defined by the occurence of amorphous lamellae in the normal crystal lattice. These lamealle formed during shock metamorphism. Shock metamorphism is a type of metamorphism that occurs when an extraterrestrial body collides with Earth, and extremely high pressures and high temperatures are reached. 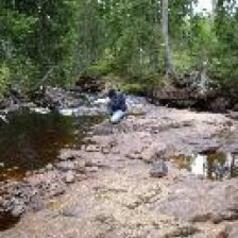 Siljan, which is an impact structure (or crater) located in south-central Sweden, has been the main focus of my studies. Supervisors: Ulf Söderlund (main supervisor, LU), Ludovic Ferrière (Natural History Museum, Vienna), Matthias Meier (ETH Zürich), Anders Scherstén (LU).